This Rothschild is a magnificent blend of different aged tobaccos that offers an exceptional mellow smoke. 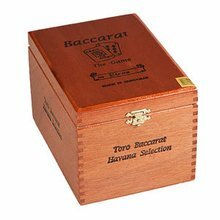 It is crafted in the Camacho factory using vintage Honduran long filler tobaccos. This beauty is covered with a premium Honduran Connecticut wrapper and topped off with a sweet gum cap for a smooth, creamy finish. This wonderful smoke emits notes of cocoa, nutmeg, and wheat. Packaged in a pack of 5. I’ve never tried this brand before and I was impressed how evenly it burned. Lights well and burns well. Great smell. Good taste. I put this on the top of my list for every day cigar. Does't fall apart. I was turned to this brand from a friend over 12 years ago and have never regretted the smoke since. The cost is fair and the flavor and overall construction is good. Has a little sweet taste,has a good draw.has a nice creamy taste,over all a nice cigar for the money. Always a good smoke,mid great taste. Great price, and a good Smoke. Good all around cigar.No problems what so ever. Definitely one of my top 3 smokes all time. Sweet wrapper gives this stick a sweet, tasty draw throughout. At no point for it get hasrsh but by the last 1/3, you're getting a richer, stronger smoke. Will absolutely be buying again. Very good cigar can't wait to burn another. Won a five pack so now I can enjoy them even more. 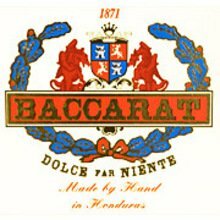 I've had Baccarat cigar s before. They are mild and creamy. A little sweet at first which subsides. Don't get much else. But a great stick for the price. Sweet and smooth, from a Maduro smoker this is a fantastic stick for when I want a mild cigar. Great draw, plentiful smoke production. 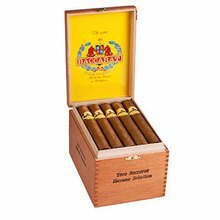 Overall pleasant Cigar but more importantly, it's easy on your Wallet. Good smoke on a sunny day. It had a great middle smooth draw. I liked it so much I'm getting more. Great, mello, smooth anytime of the day cigar! It has a nice sweetness on the tip which really makes it a nice smoke!